What do the worlds of global finance and nationalist populism have in common? How can we understand the rise of today’s 'new fascisms' through the prism of financialization? This one-day workshop brings together scholars from across disciplines to debate these key questions for our understanding of contemporary capitalism. The workshop is part of Public Seminar's Imaginal Politics initiative and is organised jointly with the Department of Social Science, University College London. The workshop will include three panel discussions and wiil close with a talk by Judith Butler on 'Anti-gender ideology and the new fascism’. Please note that this event takes place in two different locations. 6 E 16 Street Room D1103 (Wolff) and 63 5 Ave Room UL104. 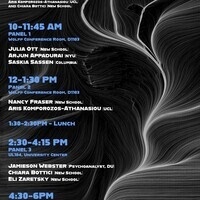 Presented by the New School for Social Research and the Philosophy Department at The New School.